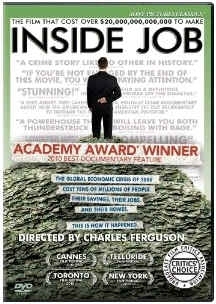 This priceless documentary presents a devastating expose of the staggering Wall Street swindle that caused the economic meltdown of 2008. The interview with Martin Feldstein brought back to mind the hoopla of his appointment as chief economic adviser to President Reagan. The movie points out that Feldstein initiated the financial deregulation follies that led to the looting of the Savings and Loans and culminated with the passage of the Commodity Futures Modernization Act of 2000, the lead sponsor of which was Senator Phil Gramm. It was truly depressing to see how this massive swindle was pulled off through the collusion of the economic advisers, politicians, high-flown professors of economics with scandalous and highly unethical conflicts-of-interest, investment banks, and ratings agencies. At the end of "Inside Job," Robert Gnaizda lists various groups that should be prosecuted. When asked why this has not been done, he answered: "It's a Wall Street government!"